FC Halifax Town and Macclesfield drew 2-2 in an action-packed game at The Shay to leave the hosts’ play-off hopes hanging in the balance. Town got off to a dream start when Scott Boden’s shot hit Thierry Audel and went in but Macclesfield hit back with a brace by Jack Sampson to lead at half-time. Substitute Will Hatfield’s first goal for the club brought Halifax level after Waide fairhurst had been handed a straight red card. But that was only part of the story, with another brawl after the end of the game, which was in-keeping with a match packed with feisty tackles and both sides going hell for leather. A draw is a credible result against a well-oiled Macclesfield side who showed enough to warrant their lofty status in the table. But wins are what Halifax need at this stage, and surely only three points will now do at Lincoln on Monday if their play-off hopes are to continue. Town wasted little time in opening the scoring at Nuneaton and if Neil Aspin asked for a repeat performance, he got it as Scott Boden’s shot was diverted past the wrong-footed Rhys Taylor by Audel after just three minutes. The goal was given to Boden over the tannoy, but his search for his first home goal since December 2 hadn’t just ended. He formed part of a lively trio in attack, with last week’s hero Jack Muldoon and Jamie Jackson producing some quick, incisive play between them. Muldoon embarked on a run through the Macclesfield midfield before Jackson’s low drive was deflected just wide. But the visitors punctured the early optimism around The Shay when Sampson was left unmarked to sweep past Matt Glennon from Chris Holroyd’s low cross for his first goal since last April. The movement of Town’s attacking trio was causing problems but Macclesfield were enjoying a good spell since equalising, with an excellent run by Paul Lewis cutting through the Town defence before Alex Grant headed wide from a corner. Macclesfield’s midfield triumvirate of Lewis, Danny Whitaker and captain Paul Turnbull were at the heart of their response, belying the awful surface by regaining and retaining possession and nullifying any influence Matt Pearson and Danny Schofield tried to exert. And the impressive Whitaker teed up Sampson’s second with two shots that Glennon kept out before the striker gobbled up the loose ball from six yards. Just like Muldoon last week, he’d waited a year for a goal and now two had come along at once. No Silkmen striker had found the net in their previous eight matches. Problem solved. Macclesfield came into the game in their worst form for five months after failing to win any of their last three games, but weren’t playing like it. Neil Aspin has spoken recently of the difference in atmosphere at home and away, and the murmurs of discontent had certainly grown since Audel’s own goal, with Graham Hutchison prompting some groans with a safety-first clearance out of play when he had time to turn. But a charge forward by ex-Macclesfield man James Bolton and some industrious work by Muldoon received a more positive response from the stands. But they reserved their loudest reaction for referee Simon Bennett, he of the Marc Roberts dismissal against Wrexham, as he walked off at half-time. 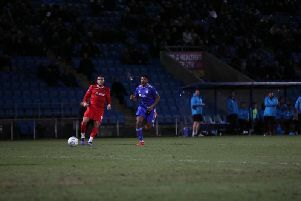 Bennett had done little to restore his reputation in these parts after the opening half, which he’d begun by booking Jackson, Town’s sole change from Nuneaton in place of Lois Maynard, after 32 seconds for a high foot. The introduction of Will Hatfield for the second-half went down well with the home fans as Town switched to a back four. The referee continued to polarise opinion after the restart, with the Town bench protesting vociferously at most of his decisions, while Macclesfield’s assistant manager and chief cheerleader Efe Sodje applauded in approval. Hatfield’s Gareth Bale-esque free-kick brought a good save from Taylor just before the hour-mark with Town the greater attacking threat but struggling to break through a resilient Macclesfield defence. A simmering battle between the sides had threatened to boil over when Turnbull was booked for a strong tackle on Pearson on the halfway line. Minutes later, it did reach boiling point when Fairhurst was given a straight red, Mr Bennett’s ninth in 14 Conference games, for a moment of madness as he moved his head in the direction of Scott McManus following a tackle. The pattern of the game was well and truly set now as Macclesfield donned their tin hats and bedded in for the last half-an-hour. Some neat build-up around the Macclesfield box saw Boden play-in Muldoon, and Hatfield side-footed in the rebound after Taylor’s save. Either side of that, Holroyd and Andy Halls were booked for full-blooded tackles, with McManus also yellow carded soon afterwards for one of his own. This was a battle for the play-offs in more ways than one. Sodje was given a stern talking to by the referee and told to curb his enthusiasm after spending most of the game standing on the touchline with his arms in the air. With the game poised at 2-2 and the opposition down to 10 men it was a carbon copy of the Gateshead game, especially when Macclesfield broke up-field with Town throwing bodies forward. And like that result, a draw does Town few favours. It was then like Forest Green all over again as a brawl broke out after full-time, with Halls throwing punches at Adam Smith as players and both benches descended on the scene. Halifax: Glennon, Bolton, M Roberts, Williams, Hutchison (Hatfield 46), McManus, Schofield (Hattersley 69), Pearson, Jackson (Smith 64), Muldoon, Boden. Subs not used: Senior, K Roberts. Macclesfield: Taylor, Halls, Audel, Pilkington, Grant, Turnbull, Lewis, Whitaker, Holroyd, Fairhurst, Sampson (Barnes-Homer 87). Subs not used: Rowe, Bell, Barrow, Haining.